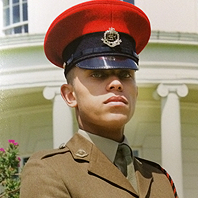 “The College helped me confirm that I wanted a career in the uniformed forces. I’d been interested in the uniformed services since I was young – I was an air cadet for four or five years, and I liked the way of life and being with your mates. I had a great time on the course, Jon Agyeman was great with me, and I learned a lot from him. I got a real boost to my confidence, particularly thanks to the Sports Leaders Level 2 part of my course. Find out about studying Public Services and A Levels at Derby College.